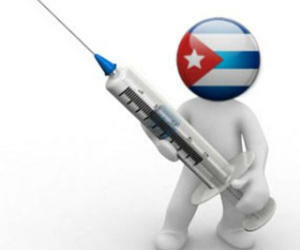 The registration of the Cuban vaccine RACOTUMOMAB, for the treatment of advanced lung cancer, was the most significant result of 2012 for the Molecular Immunology Center (CIM). The product, easy to use, can be applied in primary health and shows encouraging results in clinical trials, said Dr. Agustin Lage Davila, founding director of CIM. The scientist told Granma newspaper that with this product, the country adds two therapeutic vaccines for the mentioned ailment along with the CIMAVAX-EGF. This makes us the only nation worldwide to simultaneously evaluate two such products to treat the disease. In the specific case of RACOTUMOMAB, available production capacity can extend as of this year its application to cover patients suffering from this type of cancer in the country, and promote actions aimed at registering them abroad, he says. He noted that the experiences presented by a CIM researcher on the use of this vaccine in lung cancer therapy were recognized at the Congress of the European Society for Medical Oncology, and subsequently published in Lancet Oncology magazine as a highlight of the event. Lage said that the main goal of the institution is to turn cancer into a chronic disease that can be controlled for long periods, to slow or stop its progression, leading to more years of patients' survival with a reasonable quality of life.